2 night stay at the 5* Fota Island Resort Hotel including breakfast, dinner & VIP Spa passes. Enjoy a luxurious two night package in a deluxe room for two people at the fabulous 5* Fota Island Resort in East Cork for only €299. This Rewarding Times offer includes breakfast both mornings; a three course table d'hote dinner with a bottle of wine in the Amber Lounge or golf club on a night of your choice, €20 voucher each to use in the Fota Island Spa or on green fees, VIP Spa Thermal & Hydrotherapy passes and a late check-out. Set in the beautiful surrounds of a private island, Fota Island Hotel & Spa combines elegance and comfort with impeccable hospitality. The luxurious bedrooms offer superb views of the woodlands and three golf courses. The remodelled Fota Restaurant offers a gourmet dining experience while there is more casual dining at the Amber Lounge. With both choices local ingredients and suppliers inspire the menus. 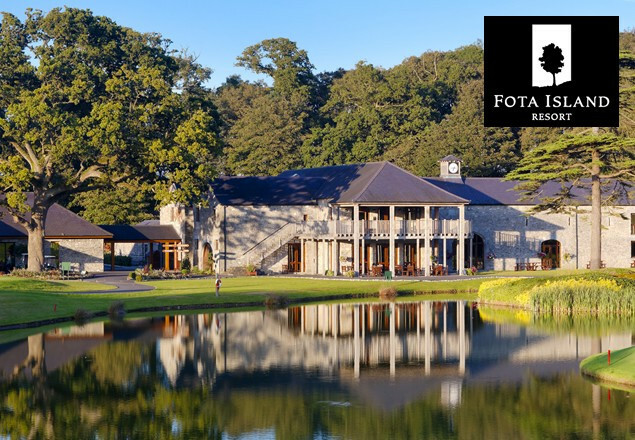 At Fota Island Resort there is a fantastic array of activities and attractions* that will appeal to all guests, including the spa, three golf courses, tennis, Fota Wildlife Park and the stunning 18th century hunting lodge Fota House, Arboretum & Gardens. Offer is valid 7 days a week from 18th January to 26th May 2016. Vouchers cannot be used Valentines night, 17th March to 3rd April, and 29th April to 2nd May. There is limited Saturday night availability. Normal booking terms and conditions apply. Breakfast is included both mornings and dinner is included on one evening only. Bar and restaurant are currently under refurbishment - limited food and beverage options. * Admission to activies and attractions are not included in the offer package. Please note - your voucher must be used by 26th May 2016. This redemption date is firm. No correspondence will be entered into regarding late redemption of your voucher. No refunds can be given after May 26th 2016.